We’ve all made the excuses…you can’t face the drive to the gym, you’re too tired at night, getting up in the morning is a chore or it’s too hot or cold outside. So you cozy up on the couch in front of the television. 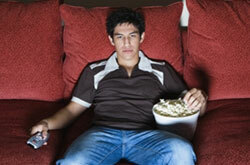 If you’re a couch potato, you’re a gambler — with your life. Unfortunately you’ll need a big sofa because you’re not the only one whose heart isn’t in physical activity. About 60 percent of adults in the U.S. are not getting the exercise they need, according to a report from the U.S. Surgeon General. It’s time to get up and face…or better yet…dance to… the music! Here are a few facts that may get you moving for your heart’s sake. Still not convinced? Here are a few facts that describe the heart-health benefits of an active lifestyle. So you’ve decided to get up and get moving. Now what? Relax. Going from flab to fit doesn’t have to take lots of time and effort. You don’t need to join a gym, work out for hours or hire a fitness coach. To stay heart-healthy and fit, the American Heart Association recommends moderate exercise for just 30 minutes, five days a week. If 30 minutes of exercise is daunting, breaking it up into two or three 10-15 minute sessions is better than nothing. Here are some tips to ensure that you’re working out at a pace that’s beneficial, yet safe. Avoid activities that make you grunt or strain. This type of strain occurs when you bear down and momentarily stop breathing to lift weights or do sit-ups or push-ups, etc., and may be harmful, particularly if you have had heart surgery in the past. A good rule of thumb is to increase your activity so you breathe hard but can still carry on a conversation. If you feel your heart pounding but can speak at length, you are working out at a safe level of activity. If you’re not used to exercising, don’t do too much too soon. Start with 10 minutes of light exercise or a brisk walk every day and gradually increase duration and intensity of your activities. If you have a chronic health condition such as heart disease, arthritis, diabetes, asthma or other health conditions, be sure to talk with your doctor about the physical activity that is best for you. Being active also promotes vigorous blood circulation, which keeps blood vessels open and flexible. Regular exercise reduces inflammation in the arteries and can lower blood pressure and cholesterol levels. Cardiac fitness also improves glucose tolerance and insulin sensitivity. This helps to prevent diabetes, which is a major cause of blood vessel damage and vascular complications that can lead to heart attack, stroke, and peripheral artery disease. The facts are clear. Regular physical activity enables your heart and your body to function at their best. So get up and go for a walk. C’mon, you can do it. The first step to a healthier you is exactly that…taking a step. We’d love to hear from you. What type of exercise do you get?